" Like a painter or a musician, a filmmaker can suggest complete mastery with just a few strokes. Jean-Pierre Melville involves us in the spell of `Le Samourai' (1967) before a word is spoken. He does it with light: a cold light, like dawn on an ugly day. And color: grays and blues. And actions that speak in place of words." "Costello [played by Alain Delon] is a killer for hire. The movie follows him with meticulous attention to detail while he establishes an alibi, kills a nightclub owner, survives a police lineup, is betrayed by those who hired him, and becomes the subject of a police manhunt that involves a cat-and-mouse chase through the Paris Metro. All the while he barely betrays an emotion." 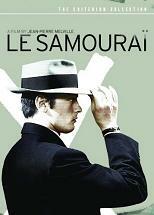 "One of the pleasures of ``Le Samourai'' is to realize how complicated the plot has grown, in its flat, deadpan way. With little dialogue and spare scenes of pure action (most of it unsensational), the movie devises a situation in which Jef is being sought all over Paris by both the police and the underworld, while he simultaneously puts his own plan into effect, and deals with both women."